All About Sodium Lauryl Sulfate! What is sodium lauryl sulfate, (SLS)? It's a coarse powder used as a foaming agent produced by combining sulfate and lauric acid. It generates lots of bubbles and lather. In a pure state it can emit toxic fumes in excessive heat. After mixed into diluted concentrations, it's then bottled and sold in name brand cleaning and hygiene products. Frankly, SLS is used by manufacturers because it's cheap to produce. Many household products contain up to 15% of this compound. IS SODIUM LAURYL SULFATE CARCINOGENIC? For years the public has perceived sodium lauryl sulfate as a carcinogenic risk. In extreme cases, it's argued to be carcinogenic, but not by itself. When exposed to other nitrogen bearing ingredients an oxidation reaction can form nitrosomes, which are carcinogenic nitrates. Opponents claim the percentage of SLS used in skin care products is not enough to cause cancer in humans. Back in the 1970's, it was discovered that some commercial shampoos contained small amounts of nitrates. Nitrates are potential carcinogens. Facts revealed this contamination was due to ethanolamine lauryl sulfate not sodium lauryl sulfate. The Occupational Safety and Health Administration, (OSHA), the National Toxicology Program, (NTP), and the International Agency for Research on Cancer, (IARC), have all rated SLS as non-carcinogenic. BODY: SLS mimics activity of estrogen hormone when absorbed into the body. This is concerning since breast cancers in women, PMS problems and drop in male fertility have all been linked to high estrogen levels. If SLS is ingested, it may cause vomiting and diarrhea. SKIN: SLS may cause eye and skin irritation. It's used in laboratories to cause skin irritations on animals and humans. Healing agents are then tested to see how well they respond to the irritations. This compound cleans by corrosion. It dissolves oils on skin by stripping it of its protective surface lipids, interrupting moisture regulation. Skin becomes dry and irritated. Rashes, infections, inflammation and contact dermatitis can all be reactions. Environmental contaminants can invade lower skin surfaces more easily. HAIR/SCALP: Over 95% of all commercial shampoos contain SLS. It de-greases hair and gets rid of dirt. SLS residue may be leftover after rinsing hair. This residue can cause dry scalp conditions. Flakiness, dandruff, redness and other scalp irritations can occur. Even though there's no hard evidence, some claim when using shampoos with SLS, long enough and repeatedly, it can weaken hair follicles. This can lead to baldness, split, dull or frizzy hair. SLS can strip color from hair follicles. Hair color fades with every wash.
NATURAL GOAT MILK SOAP: Combine goat milk with lathering soap making oils. 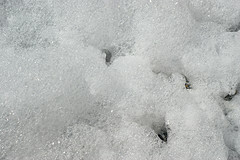 Instead of SLS, coconut oil may be used to generate lots of bubbles or lather. Add aloe vera juice or oatmeal for skin soothing properties. Relieve dry itchy skin or minor skin irritations. Reduce inflammation. Combat oily and acne prone skin. This homemade soap cleanses skin and protects against bacterial spread. Goat milk is a buffer that leaves skin close to its natural pH level. It doesn't strip the skin, like harsh manufactured chemicals. It leaves the acid layer mantle intact. Goat milk has moisture attracting and anti-aging properties. Recent studies reveals it aids in regeneration of collagen under the skin. Fine lines and wrinkles can begin to diminish. There are lots of different soap recipes, For your best skin care results make your own homemade soap! Learn how to make soap from a proven, experienced, soap maker. Save time, money and energy! Know the cautions to heed BEFORE making soap! Use proper soap making supplies and equipment. NATURAL GOAT MILK LOTION: This homemade lotion can be made with mild and gentle, natural, fragrances or made unscented. Goat milk aids in the regeneration of collagen under the skin. Combat fine lines and wrinkles. Soothe dry itchy skin, moisturize, fade discolorations, relieve sore muscles, soften, reduce inflammation and more! There are lots of different homemade lotion recipes. Make your own homemade lotion but learn from a homemade skin care expert. There are cautions to heed! CAUTION! Goat milk lotion does not hold up in extreme heat. It is susceptible to rancidity. Store preserved goat milk lotions, in a cool location, like an air conditioned room. Do not leave in cars or other areas susceptible to the sun or heat. It is recommended to use within 6 months. Do not use beyond 1 year. If you notice any foul odor, do not use. If contaminated in anyway, do not use. Be safe, throw the product away. NATURAL GOAT MILK SHAMPOO: This shampoo bar lathers up to get rid of dandruff and improve scalp conditions, without the use of harsh foaming agents. Hair is strong, shiny, soft, silky and manageable. This homemade shampoo repairs split ends. -- Oat Protein adds strength and shine to hair. -- Sugars, natural and refined, condition skin and hair. -- Melaleuca oil, (Tea Tree Oil) combats dandruff, oily hair & scalp. -- Olive, Coconut, Babassu, Castor oils are moisturizing and emollient. -- Silk retains moisture and entraps oil; it enhances hair shine and imparts a satiny feel to creams, conditioners or other liquid formulations. -- DL-Panthenol, (Pro Vitamin B 5), is a natural moisturizer used to prevent hair damage by overheating and over drying. It conditions hair without build-up and reduces damage from split ends. -- Goat milk is a buffer that leaves skin very close to its natural pH. It is mild, gentle and nourishing for the skin, hair and scalp! Harsh skin care ingredients can cause excessive oil production, dryness and flakiness. You will not have these troubles with goat milk!